It's me, King Matt. My dad sent me into hiding, and it didn't appear to do too well for me. Let's come out of hiding. 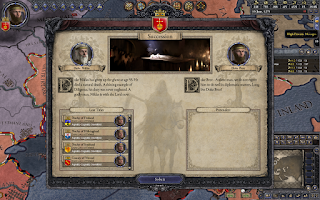 Worst thing that happens, we start the rule of my son, Count Kettil soon. Somehow, I've inherited a county surrounded by the Byzantine Empire. Can I figure out how to give that away? Gave it away to someone in my court, but it's still part of the realm. 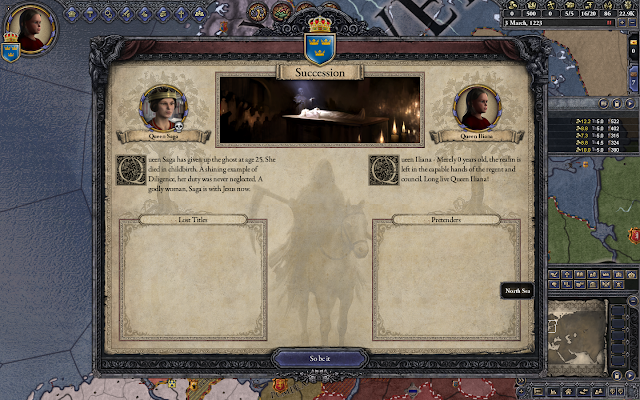 Defeated the revolting bishop, but discovered the King of Estonia was trying to kill my son. So I killed him first. OK, so I'm 12, and I don't have much territory. Not great. Let's start off by getting myself betrothed to a Greek princess. I don't have much in the way of troops (see small territory above), but I can probably afford to hire the smallest company of mercenaries (the Sami band) and take over an adjoining county. The Sami band is hired out right now, though, so I'll wait. I'm 12, I have my whole life in front of me, so I can wait. OK. That worked. Now I have three counties under my control and (in theory) bringing in money and providing troops. I have been avoiding serving my king, since I view that as rightfully mine, but perhaps I need to chill out and play along. 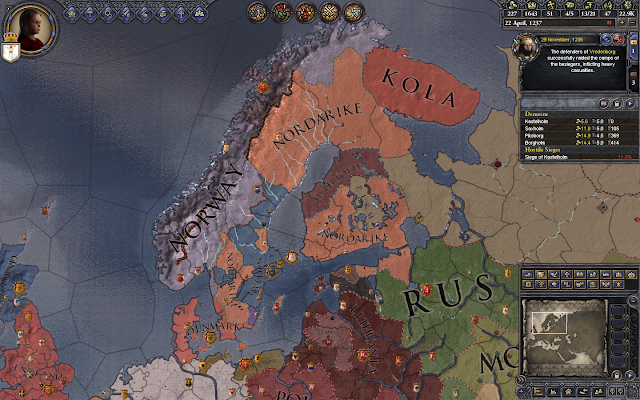 Besides, I might be best off taking back the kingdom of Sweden rather than Noridake. So now I'm Chancellor of Noridake. So, who is Duke Niklas, I hear you ask? Well, we are nothing if not about the family history, so let's take a look. He is the 28-year-old son of Count Bror of Finland (1177-1227) and Marta Ostendotter (1201-1219), Bror's third wife (of four). He has five older half-sisters, no brothers. Bror was the son of King Peter. 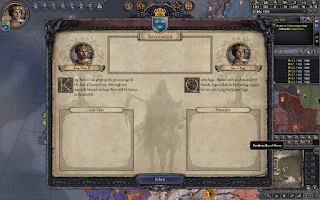 So, my dynasty started Stenkil-Inge-Boris I-Peter-Boris II-Saga-Iliana. We are now backing up to the line of Peter, with his nephew Niklas (Saga's first cousin, the late Iliana's first cousin once removed.) This is who were are depending on to reclaim the throne. He is married to the 33-year-old Duchess Elin, and they have three kids, Bror (9), Elin (5) and Lars (3). 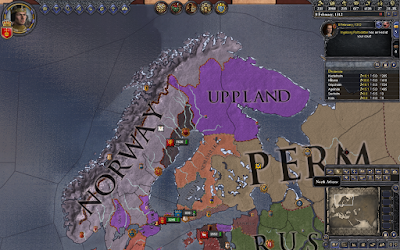 I am a Duke four times over, holding the Duchies of Uppland, Finland, Ostergotland and Halsingland. Bror is going to inherit two, and Lars two. This is the problem with gavelkind succession. OK, what do I do now? 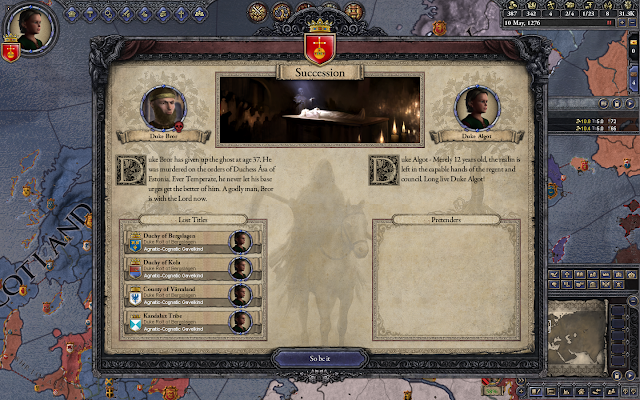 Well the first thing is to figure out who my heir is. I for some reason married my aunt, who is 17 years older, and no longer of childbearing age. We have one daughter, Princess Saga, who I make my heir. But I need to fix this, so I petition the pope (it's good to have your own pope) for a divorce, which he grants because, hello, she's my aunt. I remarry a young Russian princess and set out to produce a son. The antipapacy ended for some reason I can't determine. I am fairly weak, so I had to agree to gavelkind succession. And...it looks like I married a lesbian. No son yet. Let's see if I can get another divorce. Nope. And, I couldn't manage to kill her before I died of Camp Fever. Lame.